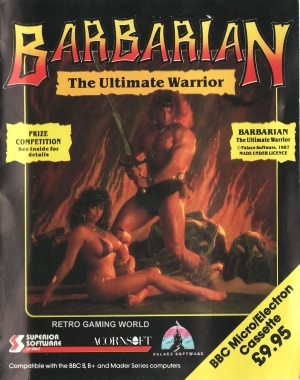 From the forgotten wastelands of the north comes the Barbarian! His task is to rescue the princess Mariana from Drax, the evil sorceror who terrorises the jewelled city. 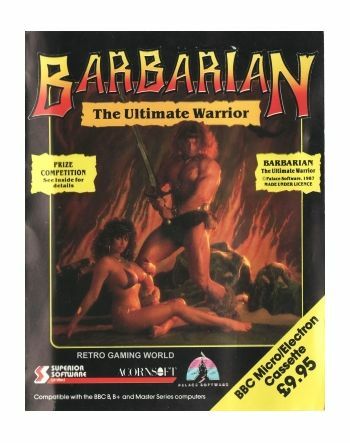 Wielding his broadsword with deadly skill, the Barbarian faces sadistic swordsmen, each more accomplished than the last. The battle ensues through barren wastes to Drax's throne room until they meet with Drax himself in the pit. The graphics are very descriptive and bloody. There are 16 moves to master if you are to survive including head butts, flying neck chops and the awesome web of death.Instructions included.